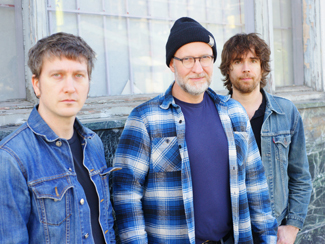 Peter EllenbyWhen Bob Mould looks back on his 2012, he should be able to reflect on a very busy and productive year. First, he released his memoirs See A Little Light – a very direct and enlightening, if somewhat dryly written, accounting of his professional and personal life over the past half-century, back in June. Shortly thereafter came the release of the complete output of his second most-important power trio in Sugar, which he’d also marked by playing the entirety of the seminal Copper Blue on tour throughout the year. And oh yeah, on top of all that, he released his first album of new material since 2009’s Life & Times in The Silver Age, rightly heralded as his strongest – and most all-out rocking – work in some time. One thing Mould didn’t get time to do this year, though, was come north of the border to play some shows. It would have been great to have one of the Copper Blue shows up here, but it didn’t happen – which makes me feel extra-fortunate that I was able to catch on at SXSW, not that that does the rest of his Toronto fanbase much good. But while it seems improbably that 2013 will be as busy for Bob as 2012, he’s added a few more dates including his first local show since Fall 2009, on March 1 at The Horseshoe. Yes he could easily play a bigger room – which is why this will be extra-great. It won’t be a Copper Blue recital – he officially retired that in November – but one of the perks of having thirty years worth of material to draw from is that he can assemble a near-infinite number of different set lists and they’ll all be fantastic. Bob will bring the tunes, you bring the earplugs. Tickets for the show are $24.50, on sale tomorrow. Another thing Mould has been doing this year? Turning to Kickstarter to fund a release of the See A Little Light: A Celebration of the Music and Legacy of Bob Mould concert film recorded in Los Angeles last November, wherein a collection of musicians including Dave Grohl, Britt Daniel, Craig Finn, and Britt Daniel came together to perform works from Mould’s entire career. Sound like something you’d want to see? Me too – so chip in if you can. And finally – last thing – Mould is doing a Reddit “Ask Me Anything” on Monday, December 17, starting at 1PM. So if there’s something you’ve been wanting to ask him – that’s your chance. Also hellaciously busy this year were Guided By Voices, with the reunited indie rock icons releasing fully three new albums in barely 11 months. So what do you do for an encore? As Tobin Sprout tells Ghettoblaster, one more album and an EP in January for sure, and maybe another album after that. The Afghan Whigs, who set stages on fire (figuratively) with their reunion tour through much of this year, play a video session for NPR. It would be reasonable to assume that Alan Sparhawk would be focusing on Low next year, what with a new album in The Invisible Way coming out March 19, but no – his Retribution Gospel Choir will release a two-track, Nels Cline-starring third album entitled 3 on January 22, with some touring scheduled for the early part of the year. A warm-up for Low, I guess. Details on the release over here. And back to Low, there’s a mini-documentary film at BYUtv about the band’s 20-year history together. NYCTaper has recordings of the first two nights of Yo La Tengo’s Hannukah shows at Maxwell’s this week. New album Fade is out January 15 and they’re at The Phoenix on February 9. Funny Or Die has got a pretty damn funny video short featuring Cat Power singing to a class of second-graders while being Cat Power. Josh Ritter has announced the return of Josh Ritter in both recorded and live formats. To the former, his new record The Beast In In Tracks will be out March 5 – stream a new song below – and to the latter, he’s announced a Spring tour that brings him to the Danforth Music Hall on April 16. Widowspeak have premiered a stream of another new song from Almanac over at Paste. The album is out January 22. Also doing the preview stream thing is Ra Ra Riot; Entertainment Weekly brings you the second taste of Beta Love, out January 22. They’re at Lee’s Palace on March 6 and there’s an interview with the band at The Shreveport Times. Spinner chats with Christopher Owens about his solo debut Lysandre. It’s out January 15 and he plays The Mod Club on January 18. Chairlift are giving away an EP’s worth of demos for Something via Soundcloud. I think your opening line should be about looking back on his 2012. Just a thought.